When I got into real estate 16 years ago, agents sought to join the ‘big box’ brokerages with the largest market share in their area. But things have changed, and today a full 57% of agents are with independent brokerages. Why? Because consumers don’t care what flag you’re flying: Only 4% choose the brand over the individual agent. The way we do real estate is evolving, and that is causing a paradigm shift in the brokerage model—a shift driven by changing agent expectations. Long Doan is the founder of Realty Group, one of the fastest growing real estate companies in the country. Long established Realty Group in 2009 to provide their 235 partner-agents in Minnesota with a full-service platform that includes training, technology and marketing support. Long has 25-plus years of experience in the real estate industry, and he is among the top 1% of agents in the state. 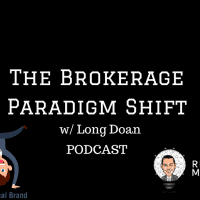 Today, Long joins me to discuss this shift in agent expectations, sharing his list of ten things to look for in a brokerage. We discuss the fact that every agent is the CEO of their own company and the broker’s role in providing support to help agents grow in the real estate business. Long explains the trend toward the flat fee brokerage revenue model, the branding mistake ‘big box’ brokerages are making, and the role of culture in bringing agents back to the office. Listen in for Long’s insight around building networking into your business plan and competing with rebate-based services by raising the industry standard of professionalism. Check out Realty Group’s website at https://www.realtygroupmn.com/, or contact Long by phone at (612) 719-3731. Long can also be found on LinkedIn at https://www.linkedin.com/in/long-doan-broker-4baa3725/.